This collection from eight talented authors boasts short stories set during the winter holiday season. These tales encompass sober themes, heartwarming messages, and uplifting endings, appropriate for the winter season or all year long. Arranged in chronological order, witness winter miracles from the mid-1800s through modern day, running the spectrum from somber to lighthearted. Learn the meaning of the season from a Civil War soldier. Go from rags to riches with a 1920s mobster. Relive a fond holiday activity with a helpful Grinchy neighbor. Create new holiday memories with a 1970s ranching family. Meet a new friend whose advice rekindles the magic of the season. Experience Christmas from a wise, aged perspective. Cross cultures and beliefs to create a new holiday tradition. Celebrate the season with estranged family after a life-changing revelation. These stories are sure to enhance your experience of the holiday season. 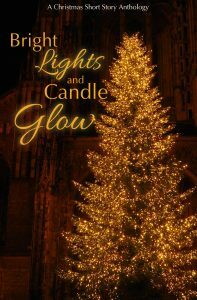 It’s a holiday-themed compilation of short stories with heavy messages and uplifting endings sure to warm the heart in the cold winter months. 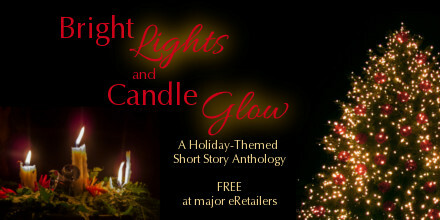 Bright Lights and Candle Glow is free. Click here for download links. “I’m not usually so down. I’m actually a cheerful person, most of the time. Anyone who knows me will tell you I’m a jolly guy. It’s just— this is a hard time of year.” Cole had never been such a downer, especially during the holiday season. Was it his weight? Something else? He didn’t know, but he felt more like Scrooge or the Grinch than he did his usual merry self. “Magical.” This time Cole answered rather than questioned.